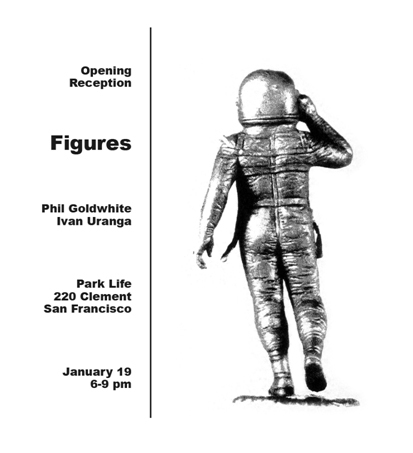 Open Reception Friday Jan 19th 6pm-9pm. hold in our hand. The desire to be dwarfed by the object. To experience the jewel. counterparts. We document the trip. Come see the results. majority of the art we interact with daily. A pleasant realization. We are surrounded. and their distinction emerges. Are we playing Gertrude? Marveling at the details? inevitable career choice and has the resulting sense of gentle urgency. common thread in their art: use what is available. The artistry of flow and nonconsumption. art and waters seeds of subsequent work. The pair are eternally grateful. would think of such a thing?” she asks, aghast. The stealing of dreams. Phil agrees. Ivan basks in the glow.